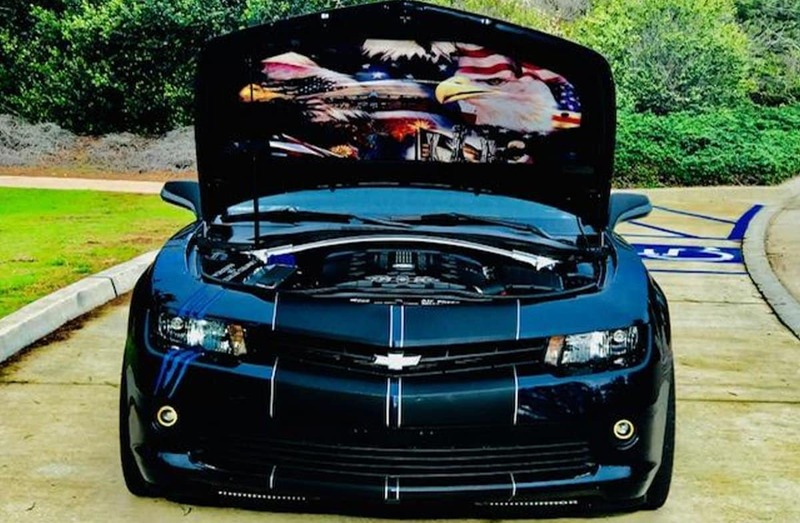 The TorqueNews/Camaros Unlimited Camaro of the Month for April 2019 is the military-themed 2015 LS shown here, owned by Keith Penland. Each month, TorqueNews works with the members from the Camaros Unlimited Facebook group to select our Camaro of the Month. The process begins with the members of the Camaros Unlimited Facebook page – more than 42,000 of them – nominating their favorite Chevrolet Camaro owned by a fellow member of the page. Once five owners have been nominated, the voting begins and when the balloting closes – we have our Camaro of the Month. For April 2019, the members chose this gorgeous 2015 Chevrolet Camaro LS and when the community members picked this car as their favorite for the month, I reached out to the Penland for more information. Below, you will find his story, which includes a second Camaro as well. My Camaro is a 2015 LS. Its paint color is Blue Velvet Metallic. I am a retired Air Force veteran. We got Ms. Blue (that’s her name) on Veterans Day 2015. Camaros have been part of our lives since 2010, when I rented one to go pickup my future wife. We also have a 2011 Camaro SS/RS. We use the Camaro for events, like Trunk or Treat for Halloween. We also participate in Parade of Lights at Vandenberg Air Force Base in California at Christmas Time for the kids on base, allowing me to showcase the custom LED lighting. 6. Upgraded Speakers and added Amp. 7. Under hood Mural by Wrap n Graphics in Bakersfield Ca. Also Wiring Harness cover and other mural in trunk with eagles and Flags by Wrap N Graphics. 8. Over 300 LEDs that change color and beat to music. Who’s knows what else. Always a work in progress. Congratulations to Keith Penland and his 2015 Chevrolet Camaro LS for being named the Camaro of the Month for April 2019. If you would like to participate in the Camaro of the Month program with your Chevy muscle car, click here to join Camaros Unlimited!